If you signed up for the Buy Hand for the Holidays Challenge and you are just now realizing you only have a little bit of time left and you still haven't gotten all your gifts ready, you may be panicking. Now is the time to reassess what gifts you are giving and make it a little easy on yourself. You can either kick things into high gear and start cranking things out, or give yourself a break from the expectation that you were going to hand knit everyone a new sweater from Vogue Knitting. So, pick out some new gifts that are easy to do. If you can sew, then making some silk lavender eye masks or microwaveable heating pads are quick, easy to do, and highly appreciated. 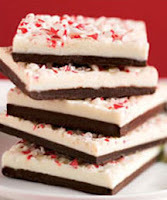 If you like to cook, then whipping up some peppermint bark, homemade almond roca, handmade marshmallows and chili-lime spiced nuts can be done in large quantities. Don't neglect those pets! Homemade dog treats are sure to please even the most picky of pooches. The candy cane body scrub I made last year was a big hit and super easy (and cheap) to make. The whipped body butter was also easy to make in large batches. Finally, don't forget those jars of jam you canned last summer - just dress them up with some labels and fabric toppings for a more festive look. You did make some of my Masala Strawberry Jam with Pinot Noir and Port and Cinnamon Ginger Plum Jam with Lillet didn't you? How are things going for your Buy Hand challenge? Are you getting desperate, or are things going okay? I have knitters fingers from trying to churn out monkeys!! Trying to make cards as well as knit a beanie hat for a friend. Then there will be cookies and Soda Cracker Candy. Yum! I made melt 'n' pour soap yesterday, it smells so good, and wrapped them into cute little recycled wrappers (brown paper bag crumbled up, a cute little card saying what scent it is all wrapped in ribbon that was on clearance at target for 50 cents. If need be, I have pickles and jam to give away (I'm kicking my self for not making more jam). I ordered the cherry pits a few weeks ago when you mentioned this, absolutely awesome! My intention was to make a bag for myself, to test of course, and if that went well I wanted to make one for my grandma. That cherry pit filled pillow has become my security blanket. Really. I don't know if I could sleep without it now. It smells good, stays warm for a long time, and also makes a nice neck pillow for when I just cant get comfortable. I'm giving grandparents low-sugar apple cider jelly and sugar-free applesauce. They're all trying to watch sugar, so they'll be happy with them. I found a few cute toys from Lehman's for my little brothers (who are 25 and 20...) but still like to play with toys. They're handmade by the Amish so I'm counting it! I'm also going to blow up a bunch of my photos to give as gifts. Perhaps I'll choose which ones today while I'm home for the SNOW DAY! I'm doing pretty well. I bought a bunch of children's books at a thrift store and have made rattles, bibs, magic fairy wands, leg warmers, and snack sacks for my little girls' stockings. I'm going to make a photo calendar for grandparents and baked goods for everyone else. So I don't have to make a huge assortment of baked goods, I'm hosting a cookie swap with some girlfriends so we can trade our goods. Still feeling a bit pressed though but this project has been intensely gratifying. I sent 11 pounds of homemade cookies to relatives out of state. For my SOs relatives, I'll be sending pumpkin butter and probably more cookies. But thanks to you and your challenge my sewing room looks like Santa's Little Sewing Sweatshop! so far I've made 9 pairs of pajama pants, 9 purses, 11 braided tug toys (from fabric scraps from the above), 3 rice bag hot packs, and mixed and packaged some of my dried summer herbs as popcorn seasoning as stocking stuffers. I made a bunch of gifts for my Mum, sister, and Nana. I finished late Sept., early Oct. so I've been able to kick back and relax. I should mention though that I don't have kids (unless you count the 30yo I live with) and I don't work. But the things I made did take a long time. And if I didn't start early I would have put it off until the last second and it would never have gotten done. we're going with homemade vanilla extract and brandy butter (aka hard sauce) for most gifts here. A good friend is getting some barely used merrills and earth shoes that I scored at the Salvation Army. The kids are getting handmedowns that I had stashed away until they grew into them. The husband is getting something new, though. He blew out his old stovetop espresso maker (bialetti) and needs either a new one or an apartment of his own to live it. Sue - Did you already buy the Bialetti? I've got one that is barely used (maybe 4 times?) that I could give to you. I ordered it directly from Bialetti in Italy a few years ago. I'll be sending a picture of the present I'm making for my daughter. You inspired me to make more things at home, and the more I try, the more I think I can do! My husband thought I was crazy to try it, but despite some cosmetic flaws that an 18 month old will never notice while she's playing with it, it's coming out great. Details and pic after I finish it! I made chai mixes for almost everyone, as well as oven mits (the kind that you put your fingers in one end and your thumb in the other and they look kind of like puppets, two flannel shirt pillows for my grandkids, who are also getting tie-dyed bedsheets, thrift store knittng needles (a slew of 'em) for my mom, as well as a German mustard crock I got for a buck!!! I made woven horsehair jewelry and fused glass jewelry for friends, and bought a fair trade laminated paper bowl for my daughter. A local handmade stoneware brie baker for a buddy, and a used books for the hubs. My mother in law is getting a thrift store hummingbird ornament and a wheeled shopping bag from the same place. Finishing up some recycled feed-bag shopping bags. And I'm wrapping everything in tissue paper from last year, using recycled ornaments and bows for package dressing. Oh, and home made goats-milk soap and hand-crocheted waskcloths for those "extras" we always get hit with. I AM caving and getting a few gift certificates for the kids. By the way, pardon the typos. I have carpal tunnel, lol. I 'pre-gave' to a number of friends at the CSA last month. The thrift stores yielded pretty little carafes and the local brewing store supplied corks to fit. I filled them with homemade Asian pear vinegar. I've also picked up some other small pretty bottles (and corks) to give homemade prickly pear liqueur in the next few weeks. The mother-in-law will get a food basket filled with easy-to-make mixtures using instant brown rice, seasonings, and some dehydrated beans and veggies. Each will be packed in a little storage container she can use for leftovers. I've tried giving her a notebook of easy recipes she can make but she just doesn't like to do much cooking from scratch for one. I'm hoping this year's gift will work better for her. I still have a few gifts to make, including body lotion and something deliciously edible. Hope to do the lotion this weekend. Working on my desktop photo calendars for the adults. Finished little House Pouches for my kids with clothespin people. Now working on the egg carton toy that I've designed for them. That's my Big Project. For last minute DIY gifts, I'd recommend the No-Sew fleece blanket I got for 1/2 price from Jo-Ann's. You just cut and tie the edges. Couldn't be easier! I got this for my niece. I had great intentions, then cheated. Parents are getting family photos - they've all said they can re-use their frames. Making cookies and Snowman bread this week for neighbors. White chocolate blueberry bark for my sister in law. I finished all the cookies that were being dispensed, so today I can the pumpkin butter I made for the remainder of the gifts. I did end up running into a small "buy nothing" problem, in that one person requested a specific type of coffee (so I bought a pound) and my dog was entered in a secret santa paws, so "he" had to buy a couple gifts for some other dogs.